[CONT](RC):All of your units without «Link Joker» get [Shield]+10000. 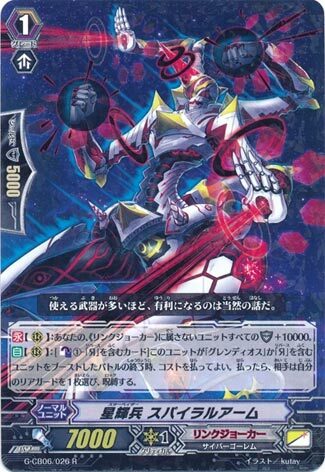 [AUTO](RC):[Counter Blast (1)-card with “Яeverse” in its card name] At the end of the battle that this unit boosted a unit with “Glendios” or “Яeverse” in its card name, you may pay the cost. If you do, your opponent chooses one of his or her rear-guards, and locks it. I guess this…exists? This card looks like it’s useful enough, turning Reverse units into stuff to guard with from the hand, but truthfully most Glendios players won’t want to do that. They want a full board for Omega Loop or as retire fodder for Omega Fall, so they’ll hold onto Reverse units before then and actively HOARD them. The extra lock combined with both of those G Units basically makes this card’s second skill largely redundant. The turn you Stride, only Reverse Cradle would even get to attack anyway, and that’s assuming a pure Link Joker board. No, you can do better than this. There’s more cards available that are relevant to the World End gambit. This card gives Glendios decks more options when it comes to how to utilize their Reverse units. When your hand is nothing but Grade 3s, with this card you’ll still have shield available. The only question is whether or not the extra shield will be enough to make Glendios players run this card over their other options in the Grade 1 slot. I doubt it. Hey finally I can do something about those pesky G3’s clogging my hand! Gone are the days Glendios is complaining about G3s clogging the hand! Am I happy this card is a thing? Yes. Will it be used? No. Glendios is still going to do the whole 0-damage thing, wether we like it or not. So for the most part, it won’t care about guarding.